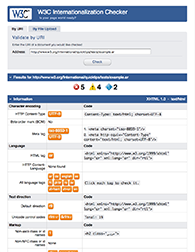 Look up and see characters (using graphics or fonts) and property information, view whole character blocks or custom ranges, select characters to paste into your document, paste in and discover unknown characters, search for characters, do hex/dec/ncr conversions, highlight character types, etc. etc. 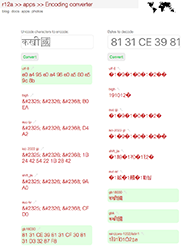 Convert between Unicode characters, Unicode code point numbers, UTF-8 and UTF-16 code units in hex, and Numeric Character References (hex and decimal), and more. Just add one type of data, click 'Convert', and see all the corresponding values. 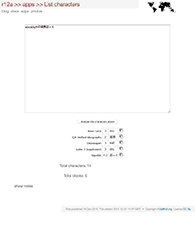 Lists the characters in text that you paste into the large box at the top, and produces information about each character, in sequence, with links to other information. You can pass the characters in the URL. Allows you to see what bytes are used by legacy encodings to represent a particular character, or to convert a sequence of bytes into characters for a range of encodings. 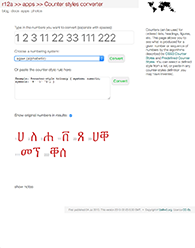 You can customise the encodings you want to experiment with by clicking on change encodings shown. 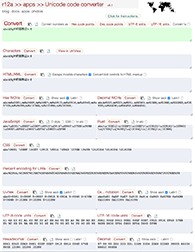 Analyses the characters in text that you paste into the large box at the top, and produces a list of what characters were used, grouped by Unicode block. 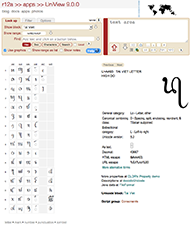 Find characters used by a particular language, or languages that use a given non-ASCII character. Pickers are likely to be most useful if you don't know a script well enough to use the native keyboard. The arrangement of characters also makes it much more useable than a regular character map utility, and they may include characters from more than one block. 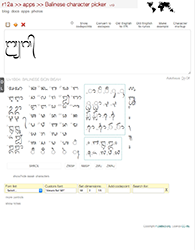 They may also include transliteration and other tools. 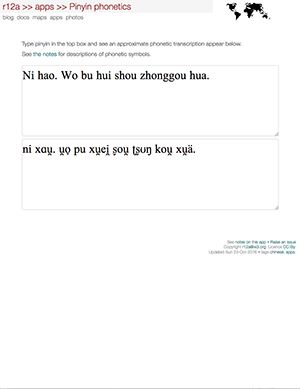 Type pinyin in the top box and see an approximate phonetic transcription appear below. 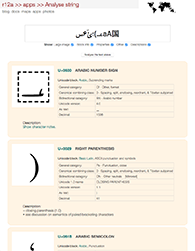 See the notes for descriptions of phonetic symbols. 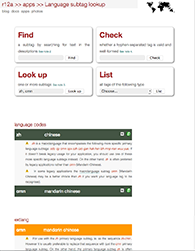 Check an HTML page for internationalization information, such as character encoding and language declarations (both in the document and in HTTP headers), non-normalized id and class names, request headers, etc. And discover errors, warnings and other advice about the international aspects of the page's HTML code. 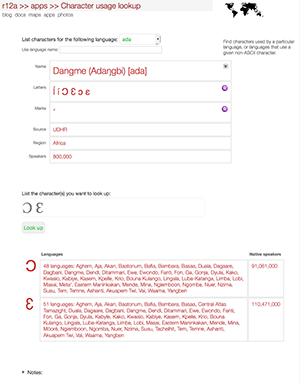 Check language tag validity, find the subtag for language, region, script, etc, find out what that tag means, or get a list of all currently available tags. This app searches the most-up-to-date version of the registry, and provides additional information to help you choose from over 8,000 subtags. Convert ASCII numbers into other representations that can be used for ordered list counters, headings, etc. 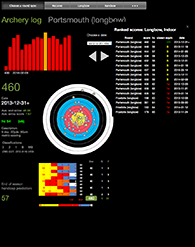 It uses the algorithms described by CSS3 Counter Styles. 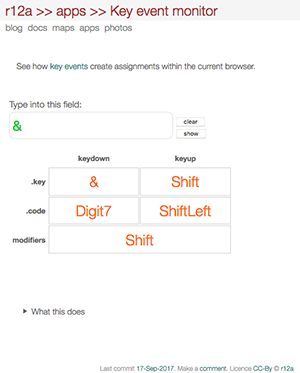 See how keyevents create assignments in the current browser. 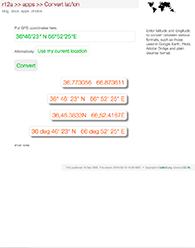 Convert GPS coordinates between different formats for latitude and longitude data. Includes formats such as those required for Google Earth/Maps, Flickr, Adobe Bridge and other applications. Last update 2019-03-10 17:34 GMT. • Copyright r12a@w3.org. Licence CC-By.